After four years of service NewsInHistory.com was shut down on August 7th, 2013. You can continue accessing the same historical newspapers NewsInHistory provided and MORE through GenealogyBank.com. Thousands of U.S. Government Documents. Thousands of Historical Books. Over 150 Years Covered. 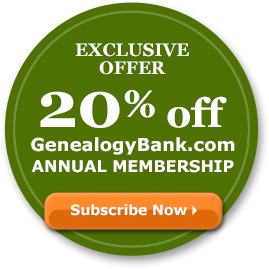 "I am an ecstatic subscriber to GenealogyBank. I found hundreds of newspaper articles about my family. And they just keep coming! I've found obituaries, dates of marriages, I could go on and on. I am truly overwhelmed! One of the best investments I have ever made."